We love swimming and everything that comes with it, which is saying a lot because collectively we have experienced almost every emotion, success or failure a person can experience in the water! We’ve learned so many life lessons from the pool that it would be impossible to deny that swimming has helped shape us into the people we are today. Who are we? We are a group of girls who have been swimming almost our entire lives. We each competed on club teams as children, reached the national level during high school, and competed in Olympic Swimming Trials, before meeting on our swim team in college. After four years at the Division I level, we’ve all found ways to keep swimming in our lives. Plus, we still have fun in the water! Our goal is for you to become more efficient so you can swim faster with less energy. We want you to improve your technique and learn to “feel” the water. We want you to push yourself effectively at practice so you have the confidence to swim smoothly on race day without taking anything away from your bike or run. Swimming is awesome because it is a sport you can do your entire life! 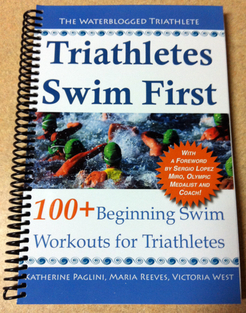 Plus, as a triathlete, the work you do in the pool will translate to your bike and run. Becoming a better swimmer will increase both your cardiovascular fitness and endurance. Unfortunately, in our experience, biking and running do not translate back to the pool in the same manner. So many “rock” swimmers are wonderful athletes on land. It isn’t fair, but it is the nature of the beast. We can help you take your swimming to the next level and add variety and fun to your workouts. Whether you are training for your first triathlon or you are a veteran triathlete, we can help you on your journey. Hi! I enjoy your tips and techniques. Reading your posts gives me a great deal of useful information and I love it. I have nominated you for the Liebster Award and featured you in my blog. Thanks for all you do! Thanks for the wonderful insight on your blog and team. I hope to learn a thing or two from you guys. Have a great weekend.